Poker is an exciting, wonderful, and liberating game that involves the joys of risk and gain. Many people play poker for fun with their friends, all night long – it’s a great way to unwind, have a few drinks or cigars, and just get into the game. However, some people are more serious with the game, taking their chances to win big by competing in events and tournaments the world over. At present we see poker players becoming famous from online games, TV shows, and championship tournaments. The scene has skyrocketed in popularity as regular folk are seeking ways to win big, just like the pros, and win big you can! Think about it this way, if you are already into poker, are good at winning and enjoy traveling, then you might want to consider the benefits of travelling to play poker. You can get two birds with one stone when you play poker internationally; you get to travel and see sites and interesting historical destinations, beaches, deserts and mountains all while playing the game you love to play! Where does one start? You’ve heard of the World Series Of Poker, but have you heard of Aussie Millions? That’s right, there are many other exciting tournaments out there to explore and compete in. Interestingly enough, as of this year, the new fangled PokerStars Championship made an appearance into the poker championships world! Let’s take a moment and look at the Big Three in more detail. The World Series Of Poker (WSOP) is an annual poker series held within the big city lights of Las Vegas! The city is known for its gambling past – having a second strip erected as the historic one just wouldn’t cut it any more. One might’ve heard of the fortunes won by millions of go-getters. Las Vegas is the epicenter of games, gambling, and winnings, so the fact that WSOP takes place there is a no-brainer. WSOP started in the 1970’s with a small batch of just 7 of the best-known poker players, competing in tournaments with cash prizes to be won. Since 2004, WSOP introduced the £772.08 no-limit hold ‘em main event which has attracted thousands of entrants and eager onlookers. 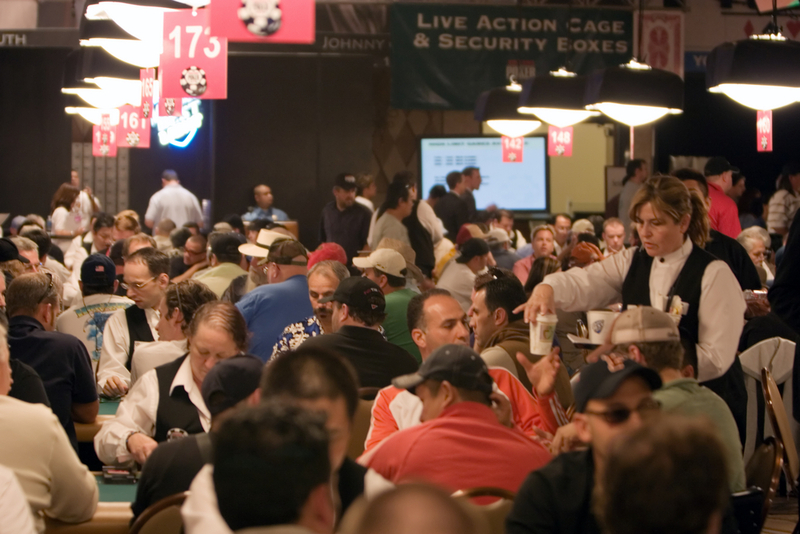 As of 2014, WSOP features most of the major poker variants, consisting of a total of 65 different events. However, most of these events are garnered towards variants of Texas hold ‘em in particular. The best part about traveling to Las Vegas to take part in, or even speculate the WSOP tournaments, is that you are literally basking in the greatness that is gambling. You get to see a city structured around the game of wins and losses. A city that has brought in tremendous wealth to the State of Nevada and the USA is an important aspect of Americanism and the American Dream. Everyone should try to go visit Las Vegas at least once in their lifetime, as it is the centre of fun, excitement, and rewards! What’s more is that the State of Nevada has legalized gambling, which means that there are other places near by to visit and gamble at as well. For instance, Reno is a smaller city that caters to the same values as Las Vegas, just at a lesser scale. Las Vegas is also situated extremely close to the Pacific coast; making Los Angeles only a few hours drive away! Aussie Millions was introduced in June 1997 at Crown Casino in Melbourne, Australia. The first major championship, the Australasian Poker Championship, was held in July 1998 featuring a main event Holdem tournament that brought in 74 entries with a total prize pool of £42,781.96! Today, the Aussie Millions jackpot take-away sits at roughly £925,771.14 as Melbourne native Shurane ‘Shaz’ Vijayaram, and Toronto Canada’s Ari Engel both took away that same amount in 2017 and 2016, respectively! What’s interesting about the Aussie Millions is that is features some of the most impressive record breaking buy-ins in history through its high roller tournaments. There is the $100,000 (£57,860.70) Challenge and the $250,000 (£144,616.44) Super High Roller event that both take place outside of the Main Event. The Aussie Millions championship definitely pulls out the big guns, and it is definitely not for the weak and meager! The big kahuna of the big three is the PokerStars Championship. The brand new tournament will take place in numerous locations across the globe in its inaugural year, this year, 2017! A new and interesting take on the poker tournament, PokerStars Championship actually moves from one location to another. It took place in Bahamas, Panama, and Macau earlier this year. You can still catch the tournament running in Monte Carlo, Monaco (April 25-May 5), or wait to visit Sochi in Russia (May 20-31), or Barcelona in Spain (August 15-27)! Both Barcelona and Monte Carlo are absolutely gorgeous cities situated on the wonderfully hospitable Mediterranean Sea. These destinations feature the height of fashion, culture, nightlife and all around good vibes. If you’re looking to spend a nice, romantic time while enjoying your poker tournament vacation, then choose no other than the PokerStars Championship Monte Carlo, or the PokerStars Championship Barcelona, you wont be disappointed! Sochi, the mainstay of Russian luxury resort destinations, will see its Casino Sochi participate in the PokerStars Championship in a month’s time. Who would want to miss out on an exciting poker adventure by the gorgeous Black Sea? The PokerStars Championship is the best thing going for the adventurous, curious, and world-traveller type of poker player. If this is the type of player you are then you would benefit greatly from following PokerStars and seeing where the tournament will land next! If you can travel on a budget, you can certainly have a gambling budget and stick to it!